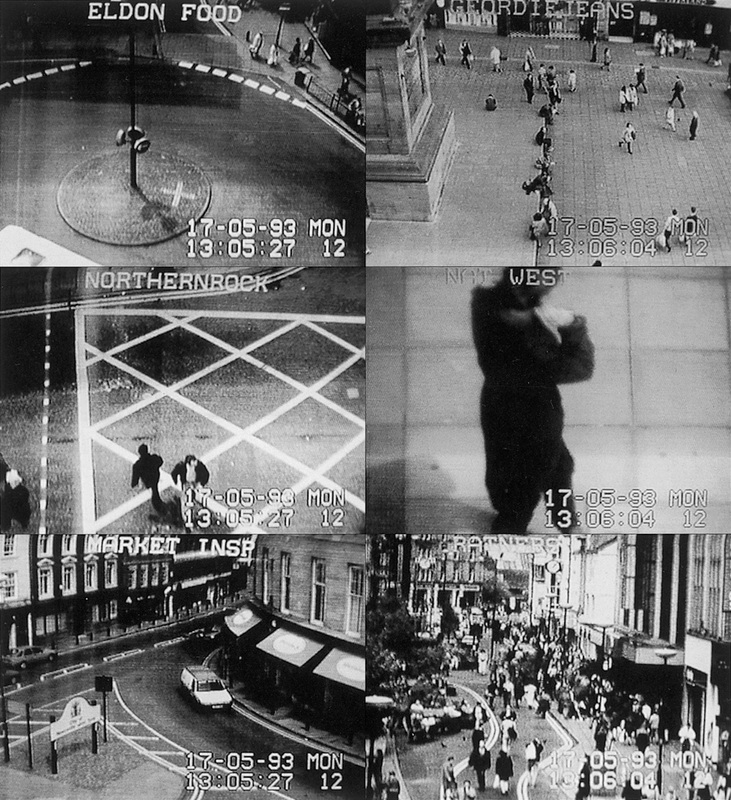 Based on the work of artists such as the Australian Denis Beaubois (1970), Thomas Y. Levin analyses the signiﬁ­c­ance and the effect of the ever-expanding system of surveillance cameras in the public space. Through performances in the public space, Beaubois plays a game with security devices. In this way he has developed a strategy for turning the panoptic effect of security and surveillance by means of cameras and facial recognition software back upon itself. 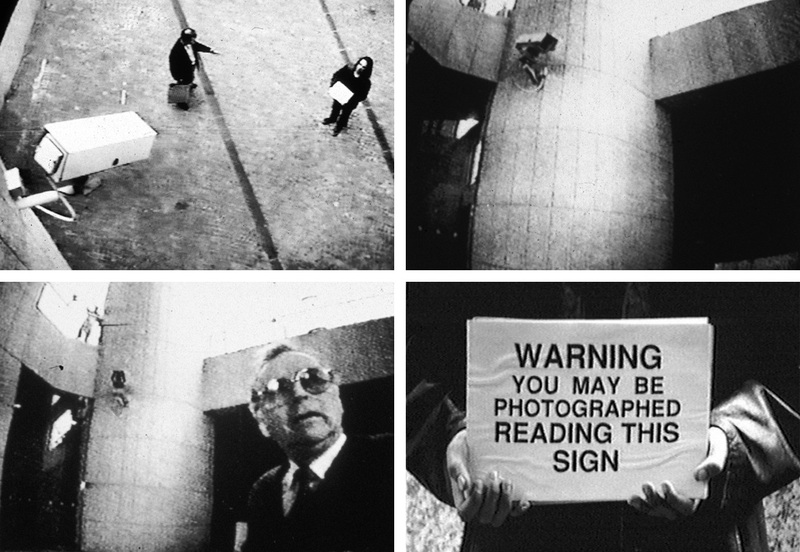 Sometime in 1996 the Australian artist Denis Beaubois embarked on a series of performances which took place throughout the city of Sidney in public spaces marked by the more or less visible presence of the increasingly ubiquitous surveillance camera. Arriving on the scene three days in a row unannounced and without having solicited or received permission to do so, Beaubois simply positioned himself in direct view of the camera whose impassive gaze he returned in kind. Armed with an unusual capacity for willed immobility (thanks to training in Butoh performance technique), his ostentatious stasis and ocular fixity sooner or later provoked some sort of response. Some­times it was so swift that Beaubois was ‘escorted’ off the ‘public’ premises only minutes after his arrival, the ‘explanation’ being that he was disturbing the peace, or lacked a permit, or some equally inconsequential – and symptomatic – bureaucratic banality. On other occasions, where his stoic performances were graciously (even if often uncomprehendingly) tolerated by the authorities, it was the passers-by who became engaged by his presence, interrupting their purposive passage to stare and inquire in an attempt to establish what exactly was going on. What exactly was going on here? According to Beaubois, these performances – entitled In the event of Amnesia, the city will recall… – posed a series of questions to the site which explored the dynamic between what he calls the ‘primary’ and the ‘secondary’ audience. The primary audience, as in the classical performance situation, is the ‘targeted’ collective which is both willing and eager to watch and interpret. In the context of the Amnesia performances, this primary audience was, as Beaubois put it, ‘the surveillance camera (or those who monitor them)’. The character of the spectatorship of this particular ‘audience’ – which will be dealt with at greater length below – is highly teleological: scanning the scene with a ‘watchdog consciousness’, it measures all behaviours against a template of norms and responds pre-emptively against any violations. For someone in its ﬁeld of vision this means that by ‘citing’ any of the proﬁles in its database (by means of one’s appearance – race, fashion, etc. – or behaviour) one can readily ‘become’ a suspect and provoke the system to focus its attention on oneself. In so doing, however, the apparatus could also be said to become part of the performance. For Beaubois the consequence of this proleptic character of surveillant observation (i.e. the fact that it already knows what it is going to see) is a mutually ideal condition: from the perspective of the camera, it effectively ensures that he will be read and attended to as suspicious; and from the point of view of the performer / suspect, it guarantees that he will be accorded an attentive and vigilant audience. But if the camera and / or camera-operator and the ‘suspect’ are both part of a collaborative performance, for whom is this event taking place? Enter the notion of the secondary audience: this largely contingent and spectatorially uncommitted group is a function of the deeply trans­itory locales (malls, passageways, etc.) which were chosen as the performance sites. It consists of the chance community, passing by en route to various places and tasks, who ﬁnd themselves fascinated by the curious spectacle and stop, if only for a moment. Perplexed by the inscrutability of Beaubois’s encounter with ‘his’ primary audience, they suddenly become aware not only of the presence of the (previously unseen even if not hidden) camera but also, possibly, of the ‘other actor’ in this collaborative performance, i.e. the surveillant agency exposed by the readable dynamic between the frozen Beaubois and the seemingly ‘active’ observation apparatus. It is, as Beaubois suggests, an economy of the glance encountering the spectacle of the gaze – as is rendered strikingly evident in a later staging of the Amnesia performance in Cleveland, Ohio (1997), where Beaubois’s static stance at the entrance to the wonderfully panop­tically named ‘Tower City’ shopping complex catches the attention and then opens the eyes, as it were, of two inner-city youths to the surveillance system they had never noticed despite their extensive familiarity with the mall. But just how is this spectacle staged? First and foremost simply by standing with intensely focused attention, in an ironic inversion of Walker Evans’s famous admonition to the potential surreptitious photographer: ‘Stare. It is the way to educate your eye and more. Stare, pry, listen, eavesdrop. Die knowing something. You are not here long.’1 Beaubois is indeed staring, but in a way that serves to ‘expose the apparatus’ in the tradition of the ideologically critical and technologically involuted left-wing ﬁlm practice of the post-May ’68 Dziga-Vertov Group, (itself a recasting of the Russian formalist notion of the ‘laying bare of the device’). This gesture is equally evident in other more or less contemporary works by Beaubois which also pointedly refunction (and thereby also expose) different sorts of ­surveillant devices imbedded in the texture of daily life: typical in this regard is the ATM Family Portrait (1996), in which Beaubois exploited the hidden transaction-recording camera in an automatic bank teller machine located in the Kings Cross section of Sidney as a means to produce a group photograph of the artist and his parents. In another similar project called Red Light Camera Portraits (1996). Beaubois carefully positioned himself at an intersection known for its photographic ‘infraction’-recording device and had a colleague drive through on red to trigger the apparatus, the ‘proof’ of the ‘transgression’ here being recast as an urban portrait generated by the state for a fee (i.e. the cost of the ﬁne for the trafﬁc violation). Both the ATM and the Red Light are very much in the tradition of a still largely unknown body of work that has engaged questions of surveillance from a variety of perspectives for many years. 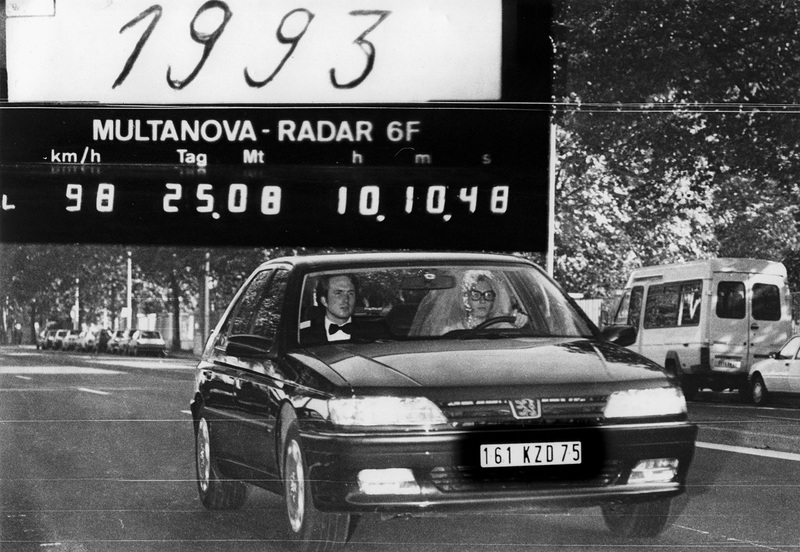 Most immedi­ately, the playful ingenuity of Beaubois’s projects recall the brilliant Fonce Alphonse (1993) by the Paris-based photographer Jeff Guess, in which the American artist and his partner raced down a Lyon street known to have a radar speed trap en route to their marriage ceremony and then waited for home delivery of the police image (complete with date and time stamp) that would constitute their sole wedding photograph. Similarly, at its most basic level, Beaubois’s Medusian gaze in the Amnesia project also invokes a number of earlier works in the history of critical artistic encounters with surveillance. 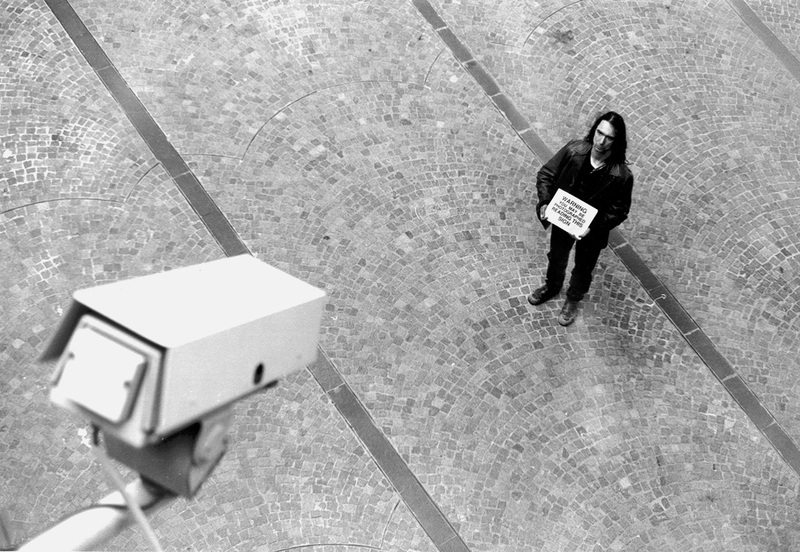 It renders explicit, for example, what was already implicit in Michael Klier’s important ﬁlm Der Riese, the almost feature-length com­pilation of footage taken entirely from an encyclopaedic catalogue of public and private surveillance cameras, whose sheer range itself already indicated the extent to which such visual tracking technology was already fully in use by the time the calendar actually made it to the allegorical year of 1984 in which the ﬁlm was released. Klier’s brilliantly simple move – to gain access to and just quote (i.e. reproduce) the output of various operational surveillance systems – is then echoed almost a decade later in the work of the British artist duo Pat Naldi and Wendy Kirkup, albeit inﬂected through a somewhat different strategy of appropriation. Making effective use of what one could call the strategics of aesthetic drag (i.e. 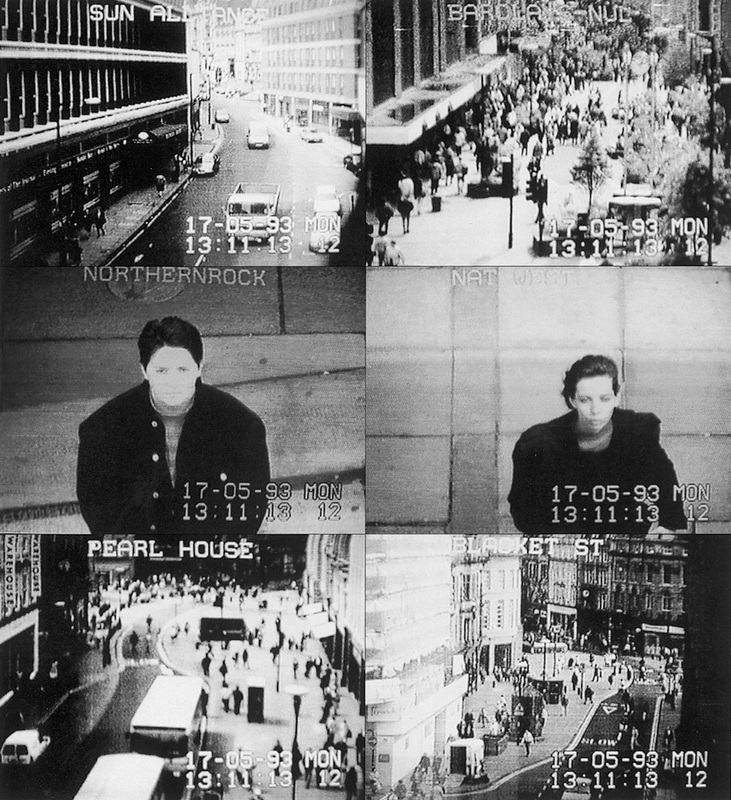 using the pretence of an ‘art project’ to undertake a political action that would, if recognized as such, most likely be impossible or much more difﬁcult to do), Naldi & Kirkup gained access in 1993 to the 16-camera system installed by the Northumbria Police in the city centre of Newcastle-upon-Tyne in order to stage a ‘synchronized walk’. Like Beaubois’s catatonia, the very triviality and aesthetic formalism of this ﬂaneurial gesture, which may have enabled them to undertake the project in the ﬁrst place, also serves to shift attention away from the artists as the ‘subjects’ of the work and onto the very means of production – i.e. the CCTV system – itself. In a country such as England, where the absence of almost any legislative constraint had already then made possible an unparalleled proliferation of CCTV systems in ‘public’ spaces, this gesture was hardly inconsequential. A similar impulse is also readable in the manner in which the footage that Naldi & Kirkup ‘harvested’ from the police surveillance system was then presented – not as some sort of fascinatingly ominous montage but rather as a series of punctual TV spots, brief 10-second silent black-and-white interruptions on the local Tynes TV network, a strategy that they employed again when they re-staged the project at the 1996 Adelaide Telstra Arts Festival in Australia and then broadcast their (now full-colour) footage as a series of 15 10-second sequences on Festival Television’s Channel 7.2 This intermittent rupturing of the normal televisual ﬂow – a strategy which Beaubois also employed to dissemin­ate some of the Amnesia performances – almost seemed to suggest the continuous presence of this economy of visual tracking ‘behind’ or ‘beneath’ the seemingly harmless continuum of daily programming. As such, it performatively invoked the constant lurking omnipresence of the surveillance system which was both the project’s condition of possibility and the then still largely invisible fact that it served to expose. Considered in terms of classic panoptical dialectics, such ‘exposing’ of the surveillant system is at some level, of course, not only compatible with its successful operation but in fact actually promotes it: the more people know of the existence of the surveillance the ‘better’ it functions as a social technology. Since this is always more or less the case, the question is rather exactly what it is that any intervention exposes. In the case of Naldi & Kirkup what is interesting is that in their performance of the CCTV system, their controlling of the control space, they foreground both the space of the image (they ‘become the subject’ of the tracking) and the structuring of the images (the site of their production, selection, examination – i.e. the police’s surveillant control booth). In so doing they both point to the space of daily life as the site of this new form of urban spectacle, and to the surveillance apparatus as the locus of a new sort of audience. This gesture is subsequently literalized and activated in the late 1990s by the New York-based neo-situationist anarchist performance collective known as the Surveillance Camera Players. Eschewing the guise of aesthetic drag in favour of a guerrilla version of the more classically Brechtian intervention, they stage their telegraphically reduced renderings of literary works such as Orwell’s 1984 by simply barging in and appropriating extant public surveillance systems such as those present everywhere in the Manhattan subway system.3 In their commandeering of the ‘live’ closed-circuit video transmission loop between a ﬁxed camera and a ‘captive’ (and usually singular) surveillant viewer in the ticket booth, the Surveillance Camera Players employ the anti-mimetic vocabulary of the protest movement (placards on sticks, masks, and mock-acting) and then simply disappear, if they have not already been ‘asked’ to leave by the ‘forces of order’. 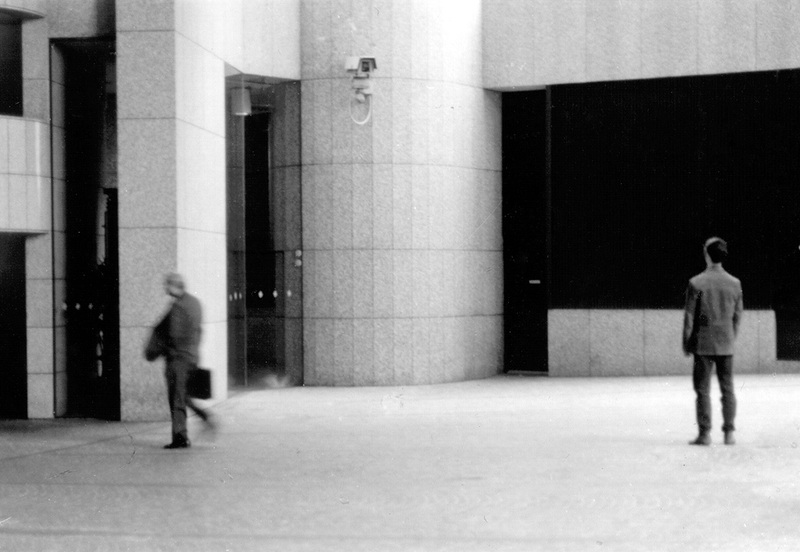 Like Naldi & Kirkup, the Surveil­lance Camera Players also hijack sites of quotidian transience for their surveillant performances, but unlike the former, the colour and synch-sound record of their actions is produced by ﬁlming (in continuous time) the monitors to which the signal of the cameras send their output. Texts also play a role in the Amnesia performances, albeit in a slightly different manner. Having captured the attention of both the ‘primary’ and ‘secondary’ audiences (i.e. the surveillance apparatus and the bystanders) by means of his interrogative corporeal ﬁxity, on Day Two (indicatively titled ‘the introduction’) Beaubois begins holding up in front of his stomach a series of white sheets with printed texts, starting with one that contains only his name. Willingly proffering to the system information which it is meant to establish against one’s will is, as such, already deeply suspicious, which in turn only makes the performer / suspect of greater ‘interest’. Having thereby further riveted the attention of one (if not both) of his audiences, the silent Beaubois then suddenly shifts registers. On day three of this silent performance (entitled ‘the dialogue and the response’) the text sheets begin to invoke their media-historical antecedents – the intertitles of early cinema – not only formally qua text frames that interrupt the ‘action’ of the performance, but also functionally in that, like these, the texts now also begin conveying crucial narrative information. ‘May I have a copy of the video footage?’ the next card inquires, indicating, through instructions spelled out on the two that follow, that a positive answer is to be indicated by moving the camera up and down, while a negative response is to be conveyed by moving the camera side to side. The implicit ocular reciprocity with which this admonition concludes (‘watch me’) is of course a seductive ﬁgure of speech: the one thing that Winston – or anyone else – cannot do is return the gaze of the tele-screen. The phantasmatic possibility of a dialogic relation with the surveillant apparatus that it invokes, however, is precisely what is staged in the Amnesia performance, through what one could call the semanticization of the PTZ [Pan, Tilt and Zoom] camera. Ingeniously recasting the mechanics of the apparatus as a semantics, i.e. as a meaning-bearing economy, we see the camera pan from side to side ‘in response’ to Beaubois’s request. The hilarious anthropomorphization which is the condition of possibility of reading this ‘denial’ of his request would seem to quell all panoptical doubts (and in this case also thespian anxiety): if I was concerned before that nobody was actually watching me, I can rest assured, since the discursive character of the camera movement, the semantics of the mechanics, clearly conﬁrms that we are dealing with some form of agency. But does it really? Given the irreducible dimension of projection involved in such a dynamic, how can we deny the possibility that the seemingly so expressive PTZ movement was in fact totally random and (in this case) fortuitous? If this were so, then we would still not know for sure whether there was someone in the tower, as it were (even as we would have to assume that there was). Software The foregrounding of this undecidability is one of the key elements of Beaubois’s Amnesia performance, which as such presciently put its ﬁnger on a panoptic tendency that, while long in the making, has only very recently begun making its ﬁrst tentative – and highly controversial – public appearances. On Sunday, 30 January 2001, the 100,000 fans who crammed into Super Bowl XXXV in Tampa all had their faces captured by a video surveillance system which then digitized them in the stadium’s ‘law enforcement control room’ so that – without their knowledge – they could be cross-checked against a biometric database containing the facial data of 1700 known ‘criminals, terrorists and con-artists’ from the Tampa Police Department and the FBI.6 While the facial recognition software by Graphco Technologies identiﬁed only 19 people with ‘insigni­ficant’ criminal histories, none of which subsequently could be apprehended, it did mark the ﬁrst highly public employment of a technology that has long been used by casinos to identify con-artists, by the welfare department to detect ‘double-dippers’, and by motor vehicle bureau’s to nab license forgers. Less than six months later, the city of Tampa Florida installed a similar ‘Smart CCTV™’ system in conjunction with a network of 36 state-of-the-art surveillance cameras in the Ybor City section of town (a popular but crime-ridden night-life district which regularly enjoys between 75,000 and 150,00 visitors during the evenings and on weekends). Here the images captured are analyzed in real time by a biometric software program called FaceIT™, manufactured by the Visionics Corporation, which breaks down every face into 80 salient data points in order to compare it with a database of 30,000 ostensible ‘criminals’. As Tampa is the ﬁrst city in the US where such a system has been installed – and it is only on loan from the manufacturer on a trial basis – the national media have been following its employment – and public reaction to it – quite closely. While FaceIT™ so far has yet to produce a single arrest, a few weeks after it was installed, there was a – surprisingly modest – public protest, at which demonstrators, some of them with bar codes on their faces, others wearing gas masks, objected to such public digitization. But by far the most revealing response came in the wake of the city’s presentation of the new system to journalists. A random image taken from the system’s cameras to demonstrate its capacities – of a man seated at a café in the Centro Ybor entertainment complex – was published widely as an illustration for the reports on this latest biometric development. Upon seeing it in U.S. News and World Report, a woman in Tulsa, Oklahoma, ‘recognized’ her ex-husband, who was wanted on Federal child neglect charges, and called the Tampa police. When they went to arrest the man, however, it turned out that he had never been married and had never been to Oklahoma – in short, they had identiﬁed the wrong guy.7 What is at stake in the dissemination of this story, of course, is the comparative fallibility of human face recognition capacities (the wife who mis-recognized her husband) when compared to that of the newest state-of-the-art biometric software: humans make mistakes, while biometric programs such as these – with a capacity of 15 million searches per minute per CPU and an ‘equal error rate of 0.68% on standard databases’8 –generally, so it is claimed, do not. While all such systems include human monitoring at some point in the chain, they do, however, raise the spectre of the ultimate prosthetic panoptic eye – one that never sleeps and is capable of the most astonishing feats of parallel processing and facial recognition. As described by the manufacturer: ‘FaceIT™ can ﬁnd human faces anywhere in the ﬁeld of view and at any distance, and it can continuously track them and crop them out of the scene, matching the face against a watch list. Totally hands off, continuous and in real-time.’ In short, we may be noticed, followed and even identiﬁed by a ‘primary audience’ which is nevertheless entirely algorithmic. The possibility of real-time biometric processing of visual surveillance data has dramatic consequences, of course, for the seemingly ‘dialogic’ dimension of Beaubois’s Amnesia performance. In response to the ‘refusal’ of the request for a copy of the video tape – which at ﬁrst glance would seem only to conﬁrm the imbalance of power characteristic of the surveillant dispositif – the ﬁnal text frame retrospectively reveals that this was, in fact, a strictly rhetorical question. ‘Warning,’ it reads, ‘you may be photographed reading this sign.’9 Indeed, Beaubois is not really asking, since he is not according the apparatus the meek acquiescence it assumes (and all too often gets). On the contrary, Beaubois has instead answered the question in advance, and in the afﬁrmative: he has no need to wait to be given a copy of the surveillant video footage because he himself is taking that footage himself, ‘shooting back’, as it were, to use the phrase so aptly invoked by the Toronto-based digital media activist Steve Mann to describe his counter-surveillance practices. In fact Beaubois’s video records of his Amnesia performances in Sidney involve quite a lot of shooting, a three-camera set-up which includes one behind and on the same plane as Beaubois that provides many of the ‘establishing’ shots, one located above the surveillance camera (thus able to invoke, even if it cannot exactly reproduce, the latter’s high-angle optical vector), and one wide-angle camera attached to the performer’s chest. The carefully edited and elegantly structured video that serves as the record of this performative détournement of the panop­ticon – and circulates in an art-world economy – reveals that both Beaubois’s primary and secondary audiences must in fact be understood as components of a performance which is staged, one could say, for the tertiary audiences in galleries, museums, and at ﬁlm- and video-festivals. Here, at least from time to time, there is actually somebody watching. 1. Walker Evans, Walker Evans at Work, Harper & Row, New York 1982, p. 160. 2. See Helen Caldwallader, ‘Pat Naldi & Wendy Kirkup, “Search’”, in: Locus+ 1993–1996, Newcastle upon Tyne: Locus+, 1996, p. 12–17; rpt. in: Julian Stallabrass, Pauline van Mourik Broekman & Niru Ratnam (eds. ), Locus Solus: Site, Identity, Technology in Contemporary Art, Black Dog Press, London, 2000. 3. Their rendition of Alfred Jarry’s Ubu Roi took place in Manhattan’s Union Square Station, Edgar Allan Poe’s The Raven and Samuel Beckett’s Waiting for Godot at the Astor Place Station, and 1984 at the IRT Station on West 14th St. Further information on the group can be found on their home page at www.notbored.org. 4. George Orwell, 1984 , Penguin, London 1989, p. 4–5. 6. The story, ﬁrst reported by Robert Trigaux (‘Cameras scanned faces for criminals’, St. Petersburg Times, 31 January 2001) was then picked up by the Los Angeles Times on 2 February 2001 (‘Criminal Faces in the Crowd still elude Hidden ID Cameras Security’). For a useful introduction to the subject, see the special section on ‘Biometrics: The Future of Identiﬁcation’ in the February 2000 issue of Computer, esp. 46. 7. Amy Herdy, ‘“They made me feel like a criminal”: He was just having lunch in Ybor City when a surveillance camera captured his image. Weeks later, the police show up’, St. Petersburg Times, 8 August 2001. 8. Publicity sheet handed out at the Visonics Stand at the 2001 CEBIT Technology Convention, Hanover, Germany. 9. This sign subsequently reappears in another Beaubois performance entitled The Accidental Contract, which took place on Eddie Ave. Central in Sidney in 1996. Here Beaubois again employed the strategy of a signifying stasis in a public space, albeit this time staring directly at a wall only a few inches from his face as a steady stream of pedestrians passed by behind him. Below the warning sign attached to his perfectly still back Beaubois held two imaging devices: one, a still camera, would take random shots of the pedestrian landscape which Beaubois himself could not see. The other, a video camera, provided a continuous record of the street dynamics and was complimented by another (manned) video camera across the street which effectively provided the ‘reverse shot’. In gallery installations of the project, the still images would be accompanied by the two video feeds presented on either side of a room, placing the viewer in the force ﬁeld of the original ‘secondary’ audience.
) Thomas Y. Levin is a professor at Princeton University, where he teaches culture and media theory.